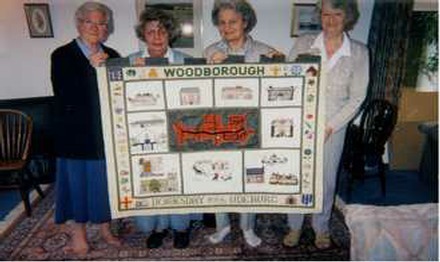 A tapestry to celebrate the new Millennium was born from ideas of local residents, Margaret Bagley, Norah Jackson and Pat Burton, all members of the Woodborough Craft Group, who wanted to record the history of the village in tapestry form. 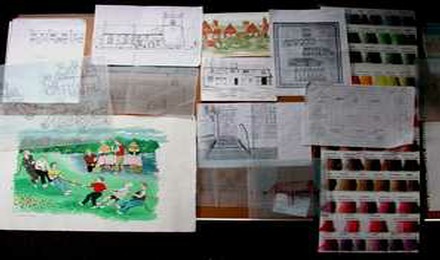 The Group looked at photographs of other maps and also shared ideas about which buildings to include, gradually a layout was formed and the Craft Group members decided which subjects they themselves would tackle. It was also decided the central subject would be an outline map of the village, which itself would be surrounded by much detail as described below. Left: Swatches and samples. 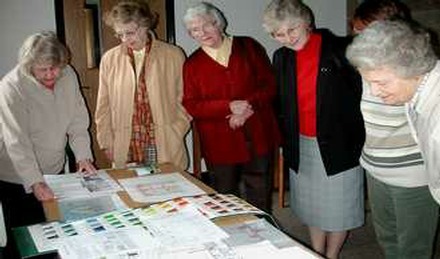 Right: The Craft Group making final material selections. TOP: Public Houses, clubs and village organisations, and the village name done boldly. LEFT BORDER: Flowers, birds, leaves, wild animals and one butterfly (all would be native to the area). RIGHT BORDER: Cereal crops, fruit and vegetables and one sheep, all to represent local farming and market gardening. BOTTOM: Coats of arms of de Woodborough and de Strelley families that built the church of St Swithun’s. A watermill, and Norman doorway of St Swithun’s and finally our Doomsday name and date. For the remaining panels; members of the Local Art Club were asked to draw the selected buildings; they had to use a style in the form of a ‘sampler’ look rather than perspective. 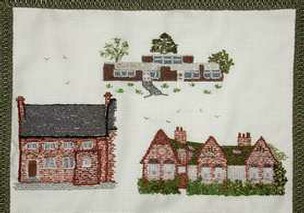 The cross-stitchers of the Craft Group had to be persuaded to cope with a variety of stitches; they used natural shades of wool that would give an authentic texture to brick, stone, tiles and windows of the buildings. 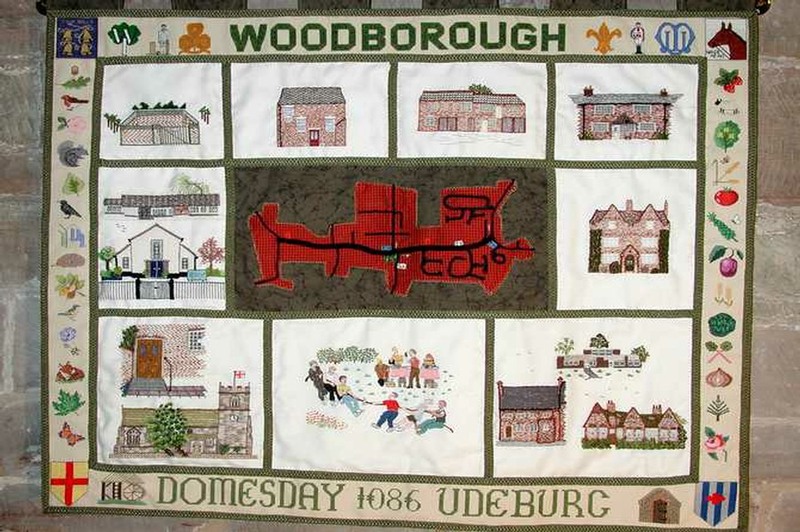 The buildings depicted in the borders of the tapestry are: The Pinfold, The Institute, a Stocking Factory, a Cottage on Church Walk, the Village Hall, the Methodist Church, Hall Farm House, the Baptist Chapel, St Swithun’s Church, the three phases of Woodborough Woods Foundation School, children participating in the annual Feast Sports, and the Street Market. Three of ten (not counting the border) examples of the Tapestry panels. 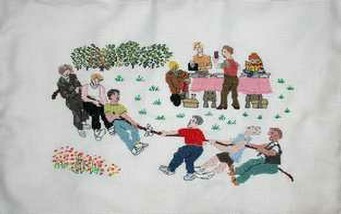 The tapestry panels took over one year to create, some members tackling several. When all the panels were complete they were brought together to be stitched to form a whole, luckily the ‘jigsaw’ fitted and the component parts were tacked on to a backing of stout cotton. Finally, fourteen metres of green braid had to be stitched between all the panels and around the frame, this turned out to be quite a difficult task. 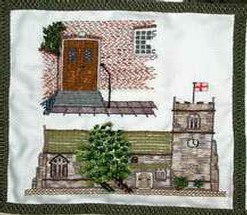 The completed tapestry now hangs in the parish church of St Swithun’s where it will be accessible to visitors of the church and village. Churchwarden, Paul Sail, created a brass rail with spearhead finials, and placed it on a wall just inside the main inner doorway. This Millennium Tapestry is a worthy celebration of the Millennium year depicting the heritage of Woodborough back to the year 1066. Members of the Craft Group have produced a work of art that will be on show in St Swithun’s Church for generations to come. 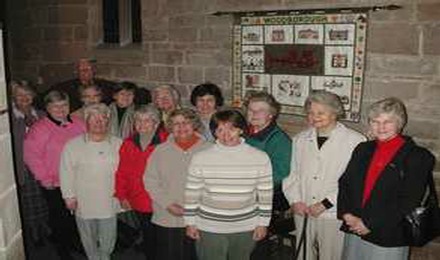 Members of the Craft Group: Mavis Archer, Margaret Bagley, David Bagley, Eva Burgess, Pat Burton, Rachel Farrands, Cara Guard, Norah Jackson, Joan Marshall, Jean Newbutt, Anne Rose, Sue Rowbotham, Pearl Simpson, Sally Swindells, Marie Waters, and Joan Winfield. Final Assembly Team: Margaret Bagley, Eva Burgess, Pat Burton, Rosemary Mee, Margaret Morgan, Marion Shotton, and Pearl Simpson. Woodborough Art Club: Frank Eggins, Shirley Hoskins, Bill Spowage, and Doug Wragg. Other Practical Helper: Enid Brow.